Vital Diagnostics provides products and services for the clinical laboratory in the traditional in-vitro diagnostics market worldwide, with a focus on the physician’s office, hospital and small-to-medium sized laboratory segments. Vital Diagnostics manufacturers and distributes clinical chemistry, hematology and immunoassay analyzers, along with reagents, designed to save the laboratory time and money. Every product manufactured meets or exceeds regulatory guidelines; the company is ISO 13485:2003 and ISO 9001:2008 certified. With customers in approximately 100 countries, Vital Diagnostics has achieved a leading market share for instruments and reagents sold into moderately complex laboratories. The Pathfast offers a combination of lock out features for users, calibration, QC and cartridge expiration. User IDs are password protected, giving piece of mind that unauthorized users cannot operate the system. The settings are user defined. 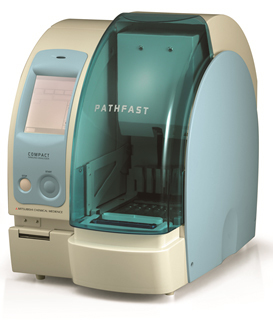 The Pathfast also provides a lockout feature for calibration, QC, and cartridge expiration. Tests cannot be reported due to expired quality control, quality control failures, calibration frequency, and reagent expiration. Barcoded reagent strips ensure that expired reagents cannot be run. Install Base Several research facilities. No clinical sites to date.